This unique fixture is installed at a private residence in Sarasota, FL. This fixture is manufactured by Purple Sage Designs. "(Atlanta, Ga. November 10, 2006) Much to the delight and request of men, there’s a revolution in the evolution of the bath! Once almost exclusively an installation in the bathrooms of train stations, ballparks, and other commercial buildings, urinals are begin-ning to trickle down to the latest designs for the residential sector. Answering the call of this new trend, Purple Sage Collections is pleased to introduce an innovative line of stand-up toilets designed to provide a superior experience—a fascinating combination of functional bathroom fixture and “art piece.” Purple Sage Collections, always a wonderful source for celebrating your own personal style, has taken a mundane object and transformed it into something special, even something beautiful. For those who want the latest in bath design, these new, deftly handcrafted urinals can provide a splash of color or whimsy along with the advantage of water conservation, no lid to fuss with, and a tidier toilet for the women. This home urinal trend is in the works and Purple Sage has the vision. 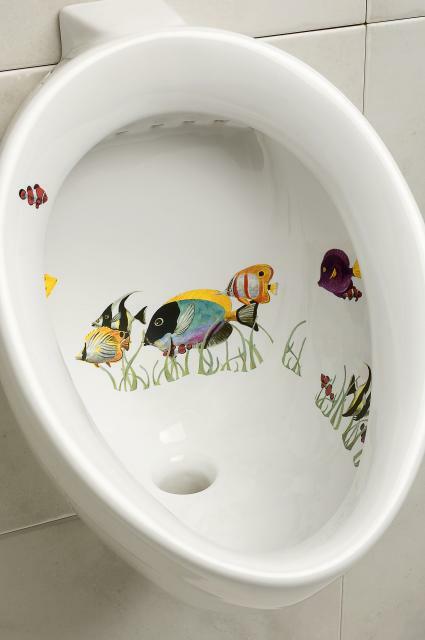 First in a series of four, the Willie I Urinal features a school of bright, multihued tropical fish swimming around the bowl. Willie Urinal designs to come will include frogs, a bull’s- eye, and even a blue fly target reminiscent of the urinal in Amsterdam. Each will retail for $545"